The Moto Z Play Droid on Verizon network is receiving a new firmware update. The update arrives with the latest monthly security patch and is being rolled out over the air. The software version of the update which is hitting Verizon Moto Z Play Droid units is NDNS25.137-24-1-4. It installs the March security patch and should be tagging along regular bug fixes as well as system enhancements. Arriving as an OTA update, it may take a while to appear on your Motorola device. In the meantime, if you are too keen to check for it without any delay, you can do so by heading to Settings > About device > System updates. If the update has arrived, you can download and install it. However, you need to ensure two things before hitting the download button — first, that your Moto Z Play Droid battery is at least 50 percent charged and second that your device is connected to a WiFi network. 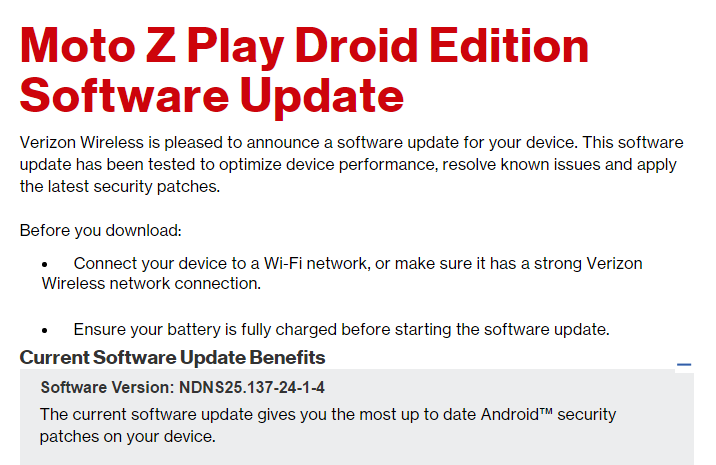 Verizon also started seeding out another firmware update to Moto Z Play Droid this month itself which bumps the OS to Android 7.0 Nougat. This Nougat update to the mentioned Motorola device arrives as software version NDNS25.137-24-1-2 and brings along all the Nougat goodies.